it is a yummy & tangy pickle prepared by meat,you can store it in your fridge for 3-4 weeks. 4 dry whole red chillies. Heat oil in a big vessel,add bay leaf, cardamom, star anise, cloves in oil. Grind the ingredients of maslas and add it in oil for 5 minutes. Add salt and lime juice & serve. Priyanka ji, I wish to try this but do`nt know what is `STAR ANISE`? plz help me. 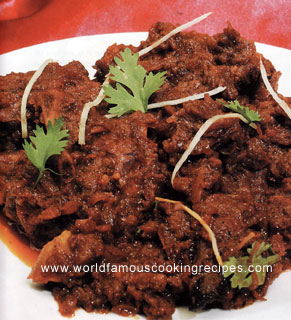 I tried this last sunday with only 250 gm Mutton chops and burnt mustard oil. Proportioned the spices accordingly. The taste was good but I guess the actual tanginess and hard hitting smell of pickle, which north indians are used to, was missing. I tried it again Yesterday with 500gm Mutton and proportionate spices. Used normal Kachchi ghani mustard oil and added Amchoor powder. It came out very well. Amazing. I learnt my lesson, stick to the recipie, leave innovation to Professionals. Thanks everyone. Dear vikram if you think that mustard oil will kill the flavour of spices,so you could try it in your own way.HAPPY COOKING! I am from Delhi and we north indian love pickle. I am currently posted in bangalore. I am sourcing Ingredients for this and will make this Pickle this saturday. Lets see how it goes :-) . I have a question Mustard oil's smell and flavour is very strong anyways, we are also adding mustard seeds to it. I think the mustard flavour will really overwhelm this pickle. killing the flavour of other spies. Shall I burn the mustard oil in the pan before using it? It reduces the flavour a little bit. Wow we Indians can make things out of things. Thank you. Tis is something I always heard of but never had it, guess u made it easy 4 me. Thanks for sharing.